There are some more “children’s” books that influenced me when I was a child, and I still want to talk about them, but Julian (who commented on my Survey Monday post about your favorite children’s book) got me to thinking about scary “adult” books I read as a child that not only scared me, but influenced the way I read as an adult. The very first book that came to mind was The Haunting of Hill House by Shirley Jackson. I am not ashamed to admit that this book scared the living crap out of me. I was one of those kids who walked around with their nose constantly buried in a book. While staying at my grandmother’s house on weekends and for summer vacations, there were very few kids in the neighborhood so I was left to entertain myself. There was an old bookshelf of Reader’s Digest Condensed Books and another shelf of The Encyclopedia of Knowledge that were my “go-to” books when I got bored. I read everything on those shelves over and over again. Old Yeller, A Tree Grows in Brooklyn, Mrs. ‘Arris Goes to Paris, and many others. The only one I didn’t read more than once was The Haunting of Hill House. I have read it many times since, as an adult, but only once as a child. Shirley Jackson was a writer that made you think. She made you think of scary things. Not “in your face” scary. More like sneaky, “slink-around-the-corner-and-hit-you-before-you-know-it” scary. Make you “stay-awake-all-night-and-think-about-it” scary. The Haunting of Hill House isn’t a book for kids. Now. Turn off all your lights and turn on your little, tiny, insignificant book light and read it again. Tell me that you didn’t finish reading that paragraph and stop to quickly take a peek around your darkened room. Jackson makes it a point of telling us Hill House’s walls are upright, it’s floors are firm, the brickwork is good, and doors are squarely framed. “This isn’t a scary looking house,” she says. It looks normal. It’s a strong house. It been standing for 80 years and may be standing for another 80 years. But she also makes it a point of telling us that Hill House is “not sane”. Can a house be insane? Or is she already, in one gloriously written paragraph, juxtaposing the real and the unreal, the sane versus the insane, in an attempt to set us up for what is to come? 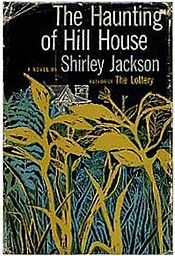 When Hill House was published, Jackson was already well known for her shocking and haunted short story, The Lottery, which is a tiny gem of horror all by itself. The Lottery was published in 1948 by The New Yorker and garnered more negative letters and complaints than any other story had at that time. Proof that Jackson’s writing struck a chord and struck it hard. By the time Hill House was published in 1959, Jackson had already published numerous short stories for well over 20 magazines and was also a published children’s author with several other novels for adults under her belt. Hill House is a story about a woman, Eleanor, who is among two women chosen to participate in an experiment of sorts. Dr. Montague, a “little man both knowledgeable and stubborn” is the man renting Hill House to do his paranormal investigations. Theodora is a a flaky, flirty, possibly bisexual invitee and Luke is the future owner of Hill House. The ladies, Eleanor and Theodora, are chosen to participate because they have a history with paranormal activity. Eleanor is a bit of a sad sack. She’s had a lackluster life taking care of a sick mother and now, she is dealing with an overly demanding sister and brother in law who were never around when the mother was sick but moved right in as soon as she passed. They are so dismissive of Eleanor and her wants and desires, they treat her as though she is a child who is unable to take care of herself. The brother in law goes so far as to “check” to see if Doctor Montague is a real person when he begins writing Eleanor to ask her if she is interested in participating in his investigations. Is this done out of concern for Eleanor or is this done because neither her sister, nor her brother in law, can believe that Eleanor would be of interest to anyone? My guess would be the latter. Eleanor is desperately searching for a place to belong. A place that wants her to be there and she thinks she’s found it in Hill House. So, is the house haunted? Or is it in the main character’s imagination? Is the house insane? Are the characters insane? Does it really matter? The Haunting of Hill House has been analyzed every which way but loose. Google it and you’ll find dozens of links to scholarly articles and themes by writers and students of all levels, all devoted to in-depth analysis of the meaning behind Hill House. The fact of the matter is that regardless of what the meaning is behind Hill House, it’s a terrifying read. There are no gimmicky stunts and no over-used tricks to scare you. The frights are there because we are there. We are the inquisitive investigator of the supernatural. We are the damaged, lonely woman looking for a place to belong. We are the confident, brassy woman looking to have a little bit of strange fun. And we are the young man whose interest is only in making sure there is no collateral damage. We don’t want to be there but we don’t want to leave either. Well, I take that back. We may not want to leave at first, but when we are ready to leave, the House won’t be giving us up so easily. “Yes,” Eleanor said, remembering Hillsdale. Eleanor almost giggled, thinking of herself calling, “Oh, Mrs. Dudley, I need your help in the dark,” and then she shivered. What made Hill House and Jackson so unique for their time was the fact that women were not writing books, or short stories for that matter, that centered around horrific circumstances and/or places AND the way that Jackson used terror, not horror, to entrance her reading audience and to force them to examine their fears with a microscope until they were ready to rip their eyes to shreds. If you think I’m exaggerating, I submit, as evidence, the following paragraphs from The Haunting of Hill House. Just prior to the scenes quoted below, Eleanor, who sometimes goes by Nell, and Theodora are sharing Eleanor’s bedroom because earlier, Theodora’s room was trashed and words were written (HELP ELEANOR COME HOME ELEANOR) in red blood (paint?) on the wall and the paint (blood?) was all over Theodora’s clothes. The doctor has locked up Theodora’s room and moved a bed into Eleanor’s room so they can both sleep there. It is time for bed. See what I mean? No blood. No axe murderers. No chainsaws. It is just a woman. In the dark. Holding tightly onto something’s hand. In 1963, Robert Wise directed an adaptation of The Haunting of Hill House. The movie, entitled, The Haunting, and starring Julie Harris, stayed very true to the book. The film was shot in the U.K. and is in black and white. On Bravo Television Network’s 100 Scariest Movie Moments, The Haunting comes in at Number 11 and Martin Scorsese places The Haunting first in his list of scariest movies of all time. In 1999, an updated version was released starring Catherine Zeta-Jones, Lili Taylor, Owen Wilson, and Liam Neeson. I’m sorry to say it sucked. Don’t bother watching it. Especially if you’ve seen the first version which is brilliant. A first edition/first printing from the Stephen King Horror Library published in 2003, with an introduction by Stephen King is holding good value at about $15.00. A 1959 first edition/fifth printing from Viking Press starts at $125.00. A first edition/first printing with a dust jacket in good condition (pictured above) starts at approximately $200.00 and works its way up to $1,950.00 for fine+ condition. I hope I’ve convinced you to take some time out of your busy schedule and to get yourself acquainted with the house that started it all. 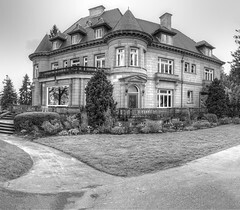 The house that pre-dated and influenced Matheson’s Hell House, King’s Rose Red, and countless others. The house that is “not sane”. The house that has stood for 80 years and may stand for 80 more. The home to whatever walks there alone. Just make sure you read it in full light. Don’t say I didn’t warn you.